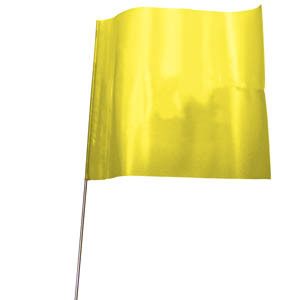 Whenever you see a bright marking flag, chances are that it's a Blackburn flag available from York Survey Supply Centre. You see them on construction sites and excavation projects. They're on the job when utility contractors are mapping out the route of underground services. Contractors use them on the golf course. Landscape gardeners are planning out their creations by pinpointing the design areas. Surveyors and engineers are constantly marking out proposed survey areas as they find them an invaluable and inexpensive aid to help them in their everyday tasks. Manufactured from a weatherproof fade resistant material for long outdoor life and can be used under all types of weather conditions. The flags consist of a non-toxic lead free grade vinyl which is secured to a 533mm wire stem. The flag size is 127 x 100mm. Flag-Marks are available in six standard colours - Red, Blue, Green, Orange, Yellow and White - allowing colour coded marking systems to be set on site.